1 dead, several injured after multi-car crash in Md. One person is dead and several injured after a multi-car crash in Silver Spring Sunday morning. SILVER SPRING, Md. 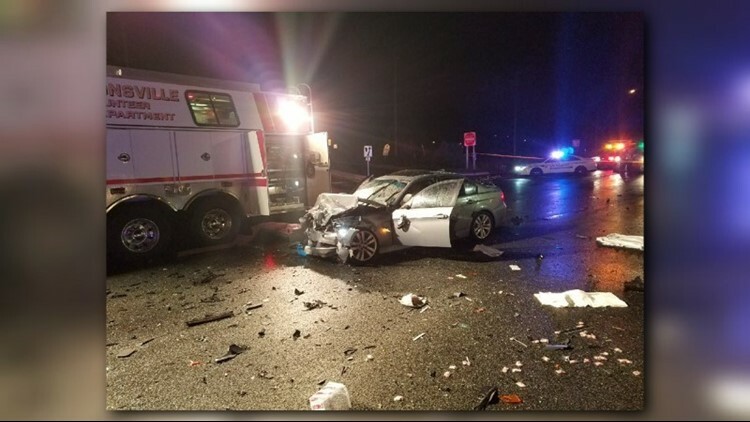 (WUSA9) — One person is dead and several injured after a multi-car crash in Silver Spring Sunday morning. The accident happened shortly after 3 a.m. at Columbia Pike and Fairland Road, said fire officials. The victims were transported to a nearby hospital. Some suffered traumatic injuries. According to police, two cars had been involved in a minor collision and had stopped in a southbound lane of Columbia Pike at Fairland Drive. After the collision, the driver and a front seat passenger of one of the cars got out of their car and were standing next to it when a third car, driven by Ivan William Kadian, 29, struck their car. The two people standing outside the car were hit, too. The driver of one of the first two cars, My Huong T. Nguyen, 45, of Greenbelt died from her injuries. One of the passengers, an adult man, standing outside the car was transported to the hospital with non-life threatening injuries, as was an adult woman sitting in the rear of the car struck a second time. Kadian, 29, of Hyattsville, was arrested at the scene for suspiscion of driving under the influence. One of Kadian's passengers, an adult male, was transported to the hospital with non-life threatening injuries. Two adult women, one the driver and the other a passenger, who were involved in the first crash were also transported to the hospital with non-life threatening injuries. According Pete Piringer with Montgomery County Fire, over two dozen firefighters arrived on scene to help the victims. Montgomery County Police are on the scene to determine what caused the accident.